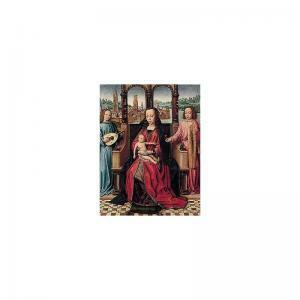 Find artworks, auction results, sale prices and pictures of Master Of The Legend Of Saint Lucy at auctions worldwide. the master of the legend of st. lucy active in bruges circa 1480 - shortly after 1500 the virgin and child enthroned with music-making angels before a prospect of bruges oil on oak panel 43 by 33.5 cm. ; 17 by 13 1/4 in. 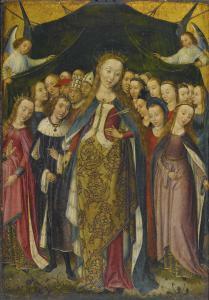 this anonymous bruges painter is named after a panel in the church of saint james, bruges, representing scenes from the life of saint lucy, which is dated 1480. in the background of that picture, and in many other pictures by this master, including the present one, there is a prospect of the city of bruges, including the prominent spire of the church of notre dame in bruges. most of the works of this master can all be dated approximately to the last two decades of the fifteenth century. many of them, including the present picture, can be dated more precisely because of the phases of construction of the bruges belfry, to the right of the spire of notre dame, which was being erected during this decade. the construction of the belfry started in 1493 and continued until 1487. in 1493 a fire ravaged the newly built lantern and destroyed the roof and spire but spared the stone octagon. this damage was not repaired until 1499 when a stone balustrade was added and the roof crowned with an image of the lion of flanders formed of beaten copper. 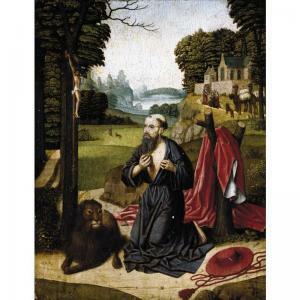 this picture shows the belfry with the lantern, but minus the roof and thus it seems plausible to place the present picture between 1493 and 1499. two workshop versions of the composition are known; one sold lempertz, 1973, (see roberts under literature below, cat. no. 16a, p. 233, reproduced fig. 34) and another formerly in the pietro monastero collection, rome 1929, (see roberts, op. cit. cat. no. 16a, p. 233, reproduced fig. 34). variants of the composition, both excluding a topographical view of bruges, are in the california palace of the legion of honour, san francisco, and the museum of art, carnegie institute, pittsburgh (friedlander, nos 152a & b). provenance: arthur sachs, new york, 1928 or before; with f. kleinberger galleries, new york, 1929; baron jo van der elst, vienna, by 1930; thence by descent. exhibited: new york, f. kleinberger galleries, loan exhibition of flemish primitives in aid of the free milk fund for babies, inc., 1929, no. 39; antwerp, exposition internationale. section d'art ancien, june-september 1930, no. 180 bis, lent by baron van der elst. literature: m.j. friedlander, die altniederlandische malerei, vol. vi, leiden 1928, p. 141, no. 152, reproduced plate lxiii; h.g. sperling, in loan exhibition of flemish primitives..., exhibition catalogue, new york 1929, p. 124, no. 39, reproduced; r. van schoene, dirk bouts und seine schule, berlin 1938, note 140b; n. verhaegen, 'le maitre de la legende de sainte lucie. precisions sur son oeuvre'' in bulletin institut roual patrimoine, no. 2, 1959, p. 80; van schoute, la chapelle royale de grenade. les primitifs flamands, vol. i, corpus de la peinture des anciens pays-bas meridionaux...brussels 1963, pp. 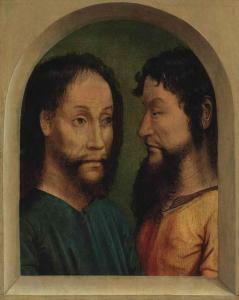 25-6; e. michiels, iconografie der stad brugge, vol. i, bruges 1964, p. 48, note 60.3.b; m.j. friedlander, early netherlandish painting, vol. via, leiden 1971, pp. 43, 63, no. 152, reproduced plate 156; a.p. de mirimonde, 'la musique chez les peintres de la fin de l'ancienne ecole de bruges'' in jaarboek koninklijk museum voor schone kunsten te antwerpen, 1976, pp. 52-3; d. de vos, 'sint lukas tekent het portret van o.-l. vrouw: een bijzondere aanwist voor brugge'' im museumleven (tijdschrift van de nederlandstalige afdeleing van de belgische museumsvereinging, 1976, p. 140 a.m. roberts, the master of the legend of saint lucy: a catalogue and critical essay, ph.d. diss., university of pennsylanvia, 1982, pp. 36-7, pp. 100-101, p. 113, p. 232, cat no. 16, reproduced fig. 33. 15 by 10 5/8 in. ; 38 by 27 cm. , Leyden and Brussels 1971, vol. VI, part II, supplement no. 242, reproduced plate 239). Another version of the present work was sold in London, Christie's, 15 December 1989, lot 28.